Body aches and chills may develop without warning. Aches may seem to exist without cause. Chills can become apparent while the sun is burning overhead. These experiences may you curious as to why they are affecting you. This article will discuss the common causes and treatments for the aches and chills that you may be experiencing at this time. Causes for Body Aches and Chills? You may not have the enough nutrients in your body and it is causing your body to react. A lack of vitamins, such as vitamin B12, may lead to anemia, chills, shaking, numbness and memory loss. A lack of iron may lead to anemia like symptoms, which may cause your body to feel as though it is aching and cold. Not enough fat in your diet may cause your body to feel cold, as your body must expend excess energy to keep you warm. Changing your diet will help with these concerns. For vegans, multivitamins will help add vitamin B12 to your diet. Vegetarians can eat eggs or dairy for B12. Iron can be found in all manner of green leafy vegetables. Fats can be found in avocados and bananas. If these changes do not help, then you may want to speak with a dietitian for a blood test to see what foods you need to add or subtract from your diet. Reduce the consumption of processed foods and unnecessary sugars, as this will make it easier for your body to extract beneficial nutrients from your meals. Stress from any area of our life may cause our body exhibit symptoms like aches and chills. Stress may be caused by environmental situations, such as violence or pollution. It may also be caused by physical problems, such as broken bones or other diseases. Additionally, worry and anxiety may cause you to become stressed. Many people experience stress in different ways than other people, so if you are in a stressful situation and experiencing aches and chills, then stress may be the cause. Reduce stress in your life if you are able to do so. If you are in a situation that you are able to leave, like an abusive relationship, then immediately do so. If you are experiencing stress from a disease, then you may want to speak with your medical professional about your concerns. Worry and anxiety can be treated by practicing mindfulness and meditation. For people who are unable to practice mindfulness, psychological medications can be used. Your thyroid gland, which is located in your throat, is responsible for hormone production and metabolism. A thyroid that functions at excessive levels causes a condition called hyperthyroidism. A thyroid that is under functioning causes a condition called hypothyroidism. Hypothyroidism may lead to a wide variety of symptoms such as lack of energy, poor memory, weight gain, aches and pains. If you believe that your body aches and chills are caused by a thyroid condition, then a simple blood test from a medical professional can confirm your concerns. Altering your diet will help your thyroid improve and normalize. Multivitamins and medications can be used for people whose dietary changes were not enough. Similar to hypothyroidism, chronic fatigue syndrome may lead to a variety of unpleasant sensations. Aches and chills may be present, along with a lack of energy and bodily fatigue. People afflicted with chronic fatigue syndrome may experience a gradual coming and going of tiredness, others may feel as though they are fatigued for months at a time. A medical professional may be able to run tests and give you medication. Often times, the best way to care for chronic fatigue syndrome is to get more exercise. This can be difficult, especially because some people may be too tired to get out of bed. With that in mind, it is possible that the body needs a jump start similar to a car with a low battery. Autoimmune diseases cause the body to act as though the cells of the body were viruses or infections. The body expends energy to develop cells that destroy healthy cells of the body. These conditions can cause fevers, joint pain, fatigue, anxiety, body aches and chills. Other symptoms may also be present depending on the type of autoimmune disease. If you believe that you are afflicted by an autoimmune disease, then speak with a medical professional. Blood tests will be able to determine what the condition is. Certain medications will be prescribed for various conditions. Be certain to reduce stress in your life as your body recovers from these afflictions. Viral infections, such as influenza or mononucleosis, often result in aches and chills in the body. Infections can range from mild to severe and may last in duration only a few days to a few months. Most viral infections have additional symptoms such as fever, weakness, nausea, vomiting and diarrhea. Coughing, pain, and sore throats may also be present. Mononucleosis may exhibit symptoms such as swollen tonsils and spleen pain. Viral infections cannot be treated with antibiotics. If you believe that you are experiencing a viral infection, then immediately seek medical attention. For those who do not normally seek medical attention, if you are experiencing these sensations and symptoms for more than a week, then you should speak with a medical professional. They may be able to offer antiviral medications to diminish the severity of the illness. The only option is to drink fluids, relax and get plenty of rest. Follow the instructions of your medical professional to diminish aches and chills. Bacterial infections, such as sinus infections, tuberculosis and pneumonia, may cause body aches and chills. Tuberculosis is a bacterial infection of the lungs and can be treated with antibiotics over an extended period of time. Bacteria that works its way into the sinus cavities may cause a sinus infection. Pneumonia, another bacterial infection of the lungs, causes the lungs to fill with fluid. All bacterial infections may be treated with antibiotics, though the effectiveness of an antibiotic regimen may vary between the infections. Headaches, trouble breathing, coughing, chest pain and other symptoms may be present. If you are experiencing any difficulties with breathing, then you should immediately speak with a medical professional. In fact, you may want to visit an emergency room if you are having trouble breathing, especially at night. The best option is to take the medications, relax, drink fluids and rest. 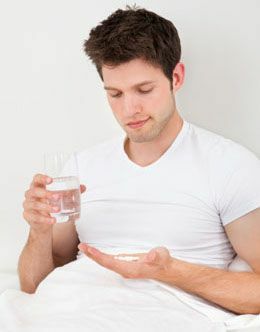 Do not stop taking your antibiotics when you start feelings better, as all of the antibiotics should be consumed to prevent a resurgence of the infection.